Well, I did not think that the first week at LondonCryo would be so busy, buzzing and so enjoyable! It started on the weekend when our amazing builders came in for some last minute touch ups to make sure we were ready (thank you to Hassan and the team at Berkely Elite) and ended with so many happy customers messaging me about how much they loved the experience. One person said he "floated out” after the treatment! Nike super coach, Becs Gentry @becsgentry, stopped by for a session — good luck with the race Becs! To get social follow us on twitter @LondonCryo Insta: LondonCryo and FB: Like us on LondonCryo. Also, a few elite athletes have been in touch to tell me they are keen to visit us. City workers have told us how much they love London Cryo’s location - just a short walk from the office and they can enjoy a three-minute treatment which completely de-stresses, removes brain fog, improves sleep, increases performance while delivering a number of other physical and mental benefits. No surprise then that much of our foot traffic came from this sector. Recovery is so important in optimising physical output and performance. Look for a blog on that topic coming soon. With the London Marathon approaching fast, we’ll have some specials aimed at assisting those running, both in the build up and more importantly, post race day. The week of Monday 27th April looks to be a busy one, we may even call it “London Marathon Recovery Week". Anna joins us having had a successful run as a sales consultant in the health and wellness space. She shares our passion for cryotherapy and is a mum and who loves to be surrounded by positive energy. Anna's approach to everything in life is, “what you put out into the universe, you get back”. Guilia is a well-grounded and hard-working individual in the pursuit of achieving her goals in the morning. At night she’s a dreamer - a wanderlust soul and yoga instructor. Guilia lives her life incorporating the best of both worlds. Naturally, this can get quite stressful! However, what we are doing at LondonCryo helps her to balance all that. She says her cryo sessions help her to release the stress, sooth the fatigue, cure muscle soreness, and look after her beauty — perfect for balancing the mind, body and soul. That’s me! I’m a native of Melbourne, Australia, a mother of two, as well as a dedicated career woman. Despite spending my whole career in accountancy, my passion has always been health and fitness. I love to train and as I have waved goodbye to my thirties, I needed a shift in how I manage my training. While visiting New York City, I gave whole body cryotherapy a try, and loved how it made me feel — physically and mentally. The reason behind this, is that in addition to the physical benefits of injury prevention and even encouraging healing, cryotherapy releases endorphins — the feel good hormones — making you feel clear-headed and happy. Who doesn’t love endorphins? I then tried cryotherapy again in Sydney and Melbourne and I was hooked! Upon returning home to London I noticed a lack of opportunity to continue with the treatment. 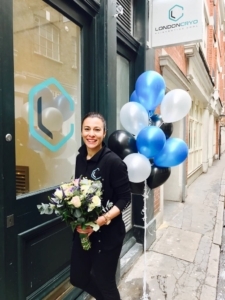 Fascinated by the physical and mental uplift behind it, and wanting to be able to add to my life, as well as give others the chance to benefit from cryotherapy, I decided to quit my job as an accountant and make whole body cryotherapy accessible to Londoners, thus the birth of LondonCryo, the first whole body cryotherapy centre in the City of London. That’s it from me for now…let’s keep Reinventing Cool @ LondonCryo. I look forward to seeing and or meeting you.